Several years ago, my husband and I found ourselves completely broke for the holidays. Like many Americans, we ended up putting the majority of gift purchases on credit cards and ended up deep in debt come January. One year was all it took for us to make a commitment to pay for the holidays in cash every year after that. So we started a year-long savings plan. Every paycheck, we took out $50 and put it in an online savings account specifically earmarked for Christmas. By the end of the year, we had about $800 saved up! Not bad, considering most Americans spend an average of $700 on Christmas gifts. But many people don’t think that far ahead, and with just 10 weeks left before the holidays, it’s time to start saving some money. If you haven’t saved a penny, don’t fret. 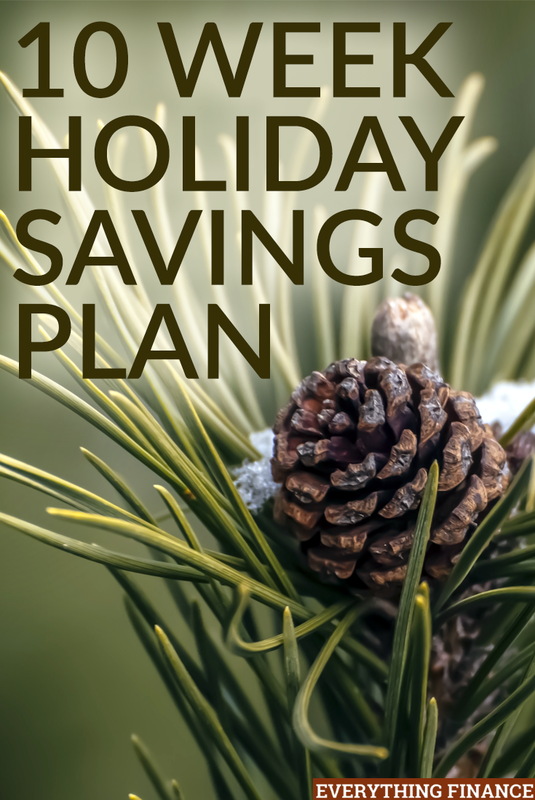 Here is your 10-week holiday savings plan. Make a complete list of everyone you need to buy gifts for and what your budget is for each gift. Include family, friends, co-workers, and tips for any household help like a gardener or your cleaning lady. Add in any additional holiday expenses, like a Christmas tree, Christmas cards, hostess gifts for all those holiday parties, etc. Now you have your complete holiday budget! Check your list twice to see if you have any leeway. Can you cut out some family members by deciding to do a Secret Santa this year instead? Or maybe have an agreement with the parents in your family that only children will exchange gifts, rather than having to get gifts for everyone. Do you need to participate in teacher gifts or can you nicely opt out of the co-worker gift exchange (which is never that great in the first place) without ruffling any feathers? When you’re on a budget, every dime counts! With your spending that is. It’s time to buckle down on your daily and monthly budget so that you can set aside some funds for the holidays. With 10 weeks left, that’s only $50 a week to come up with a budget of $500–a very respectable holiday budget. $50 a week means one less restaurant outing. Or at a little over $7 a day, that means packing your lunch instead of eating out. If cutting from your budget won’t be enough, then it’s time to make more money. Making money quickly can be done by hosting a garage sale. A garage sale will not only help you meet your holiday budget goals, but it will also help you clear away the clutter and start the New Year off fresh! Sell online if a garage sale seems too daunting. Now that you’ve narrowed down your gift-buying list, it’s time to score some hot deals. Be on the lookout for good gift deals such as interesting new products at New Easy. It’s very possible to score great gifts at a fraction of the original cost by paying attention to sales and using a combination of coupons. It’s not too late to save enough to have a fabulous holiday season! How do you plan on saving money for presents this year? Have you been saving all along, or will you ramp up in the coming weeks? When do you get all your shopping done?